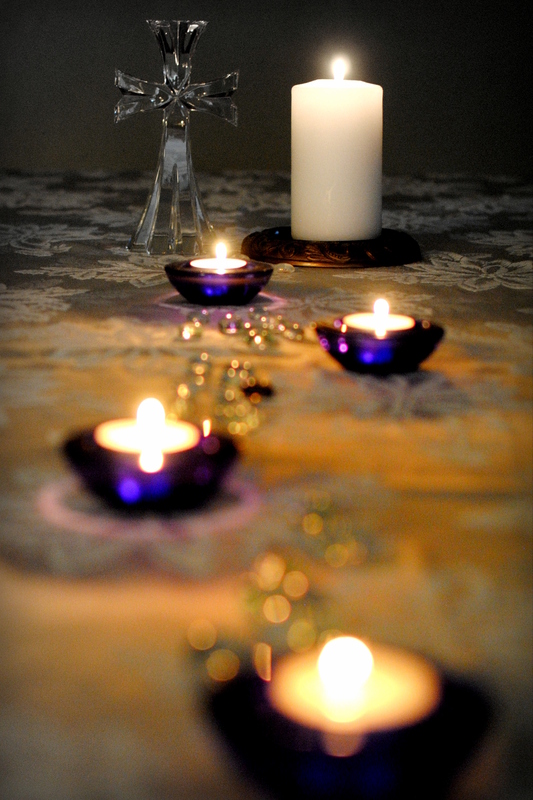 Instead of doing an Advent Wreath in our home this year, we did an Advent Path. Today the journey of Advent is over and Christmas has come again. I’m so very grateful Christ came so long ago to make a way to God. Because of Him, anyone, including me, can walk as a child of the Light. In the beginning was the Word and the Word was with God and the Word was God. The Word was with God in the beginning. Everything came into being through the Word, and without the Word nothing came into being. What came into being through the Word was life, and the life was the light for all people. The light shines in the darkness, and the darkness doesn’t extinguish the light. A man named John was sent from God. He came as a witness to testify concerning the light, so that through him everyone would believe in the light. He himself wasn’t the light, but his mission was to testify concerning the light. The true light that shines on all people was coming into the world. The light was in the world, and the world came into being through the light, but the world didn’t recognize the light. The light came to his own people, and his own people didn’t welcome him. But those who did welcome him, those who believed in his name, he authorized to become God’s children, born not from blood nor from human desire or passion, but born from God. The Word became flesh and made his home among us. We have seen his glory, glory like that of a father’s only son, full of grace and truth. Light is an important fixture at Christmas. We find lights on beautifully decorated tress, storefronts, churches and homes. Have you ever stopped to enjoy how just one candle—one string of lights can light up a dark room? Light is disruptive. It breaks up the darkness. It illuminates. God’s light is like that, shining a spotlight on things we sometimes choose not to see. What parts of our lives—of our world need a bit of that light to shine? How might we be ambassadors of that light? Like John the Baptist, how can our light point to God’s love and light in the world? This Christmas day, embrace the light that came to us in the form of a baby born in less than perfect conditions. Immanuel. God with us. May we go forth from this day as people who have seen and experienced that Light. Thanks for journeying with us this Advent. A merry Christmas to you and yours. My good friends at Orange City United Methodist Church in Orange City, Florida gave me permission to post their wonderful worship idea. One Sunday during a sermon series on the cross, Pastor Drew invited each person to write a prayer of confession on a colored piece of paper. Each person then folded the piece of paper into a flower using an origami pattern. The flowers were then attached to a large cross, making it look like it was blooming. This symbolized the forgiving and redeeming power of Jesus’ saving work on the cross. You’ll find a video of this here. 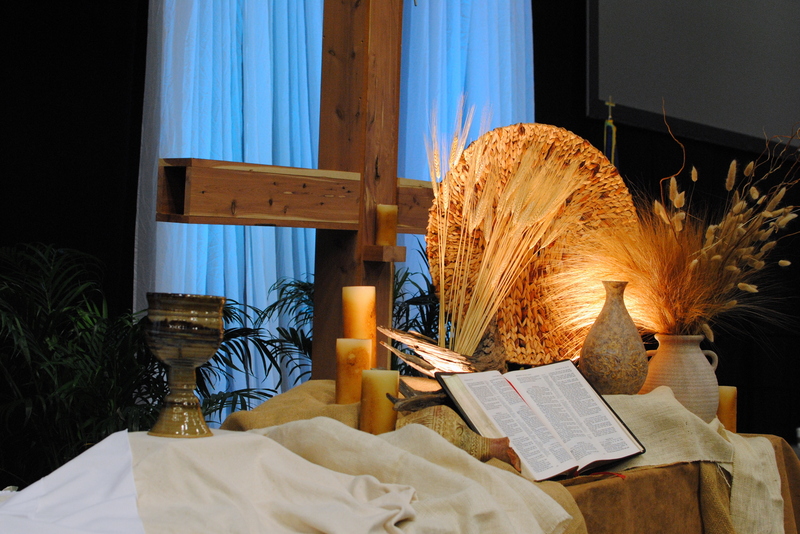 The Florida Conference of the United Methodist Church had their annual meeting recently. Every year representatives from across Florida gather for worship, workshops and the necessary organizational business. I bet you aren’t surprise to discover worship is my favorite part. Ever year includes many worship services, but I was especially moved this year by the service where we had a chance to reaffirm our baptismal vows and the service of Holy Communion. 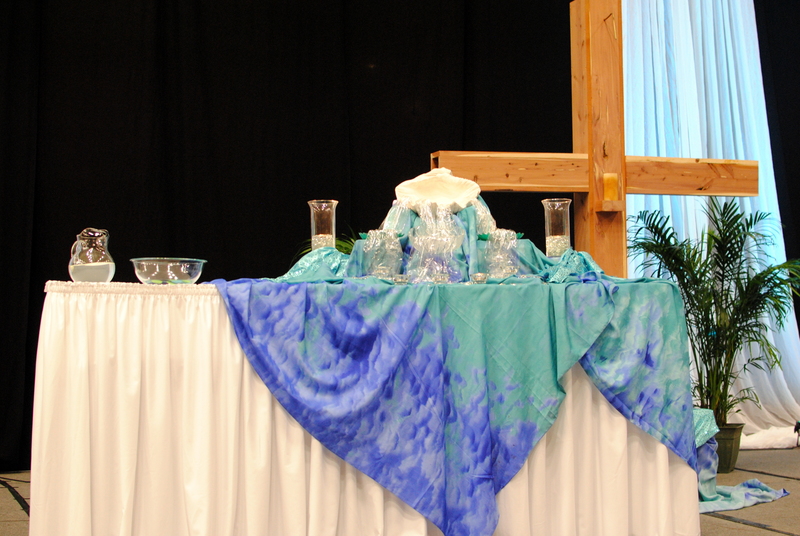 So many elements came together to awaken us to God’s presence, including the altar tables. I was thrilled to receive permission to share pictures of them on the blog. Both altarscapes were completed by Mr. Timothy Rounsaville, the Director of Worship Arts at Reeves Memorial United Methodist Church, Orlando Florida. For the baptism scape he wanted to play with different flowy and multi-dimensional fabrics to represent water and how light is in them, catches them, how the wind moves them, and how the water flows in numerous directions. I thought his use of plastic wrap was really clever. The light caught it in beautiful ways, like flowing water. It was especially effective from a distance. For the communion scape he wanted it very organic, rustic, arid, and almost harsh with the use of burlap and dried wheat, driftwood, suede and leader. He wanted the burlap for it’s reference to sackcloth – how we come repentant to the altar to receive and leave a changed individual. Wow! I appreciate his vision for emphasizing the beauty and differences of each sacrament. 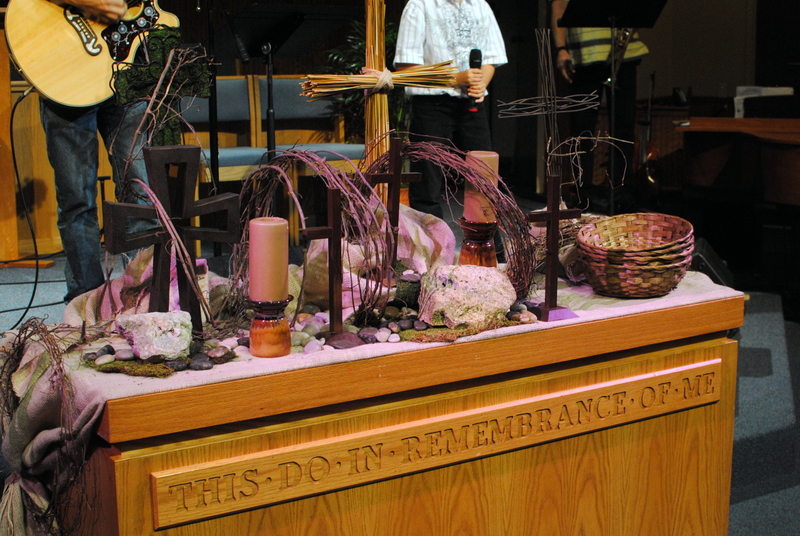 How are you preaching God’s Word visually in your worship services? Reflecting Dust is a multimedia work created for Community United Methodist Church in DeBary, Florida by Connie Berger and Nicole Sallee. Mediums include paper, paint, charcoal, wood and nails. It was featured recently in an Ash Wednesday prayer station. How does this piece speak to you? Is art helpful to you in expressing yourself to God? Or in receiving God’s expression to you? Please contact them directly for information and permission to publish or use this work in any form. 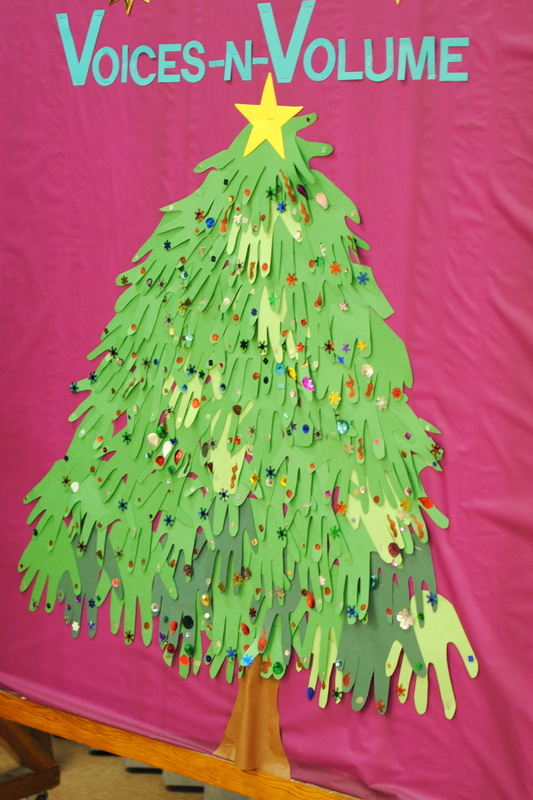 My friend and colleague Corey Trinkl, Director of Children’s Ministries at Community UMC in DeBary FL, created this terrific bulletin board from the efforts of many little hands. Literally! 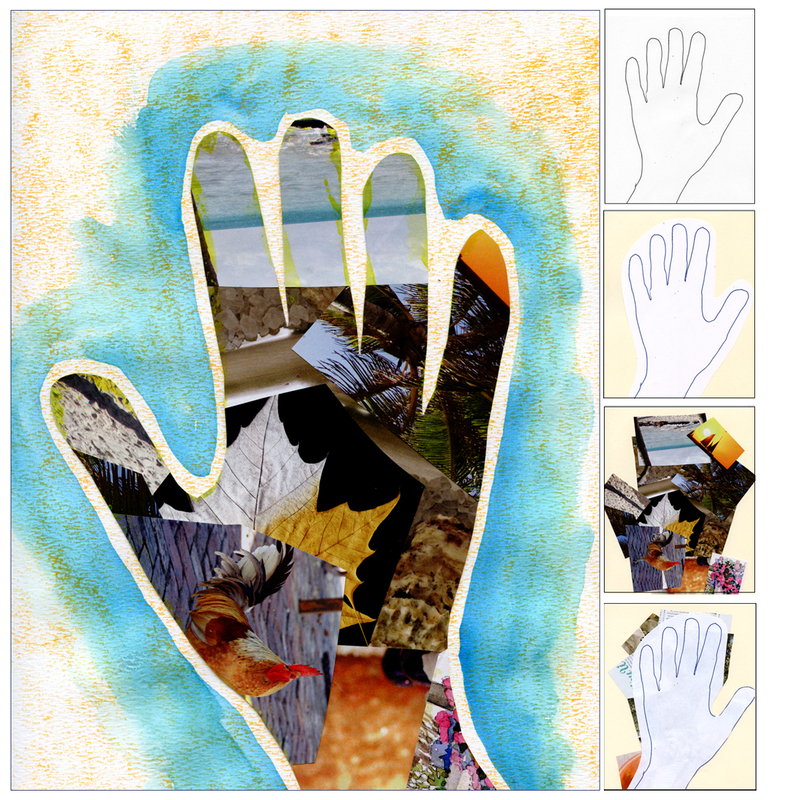 The children traced their hands and cut out the shapes, decorated the fingers, and then Corey arranged them into this display. For more information on the CUMC Children’s Ministry, including Voices ‘N Volume, our afterschool arts program for children grades PreK-5th, click here.